The “doom and gloom” surrounding climate change and extreme weather events makes communication about them difficult. 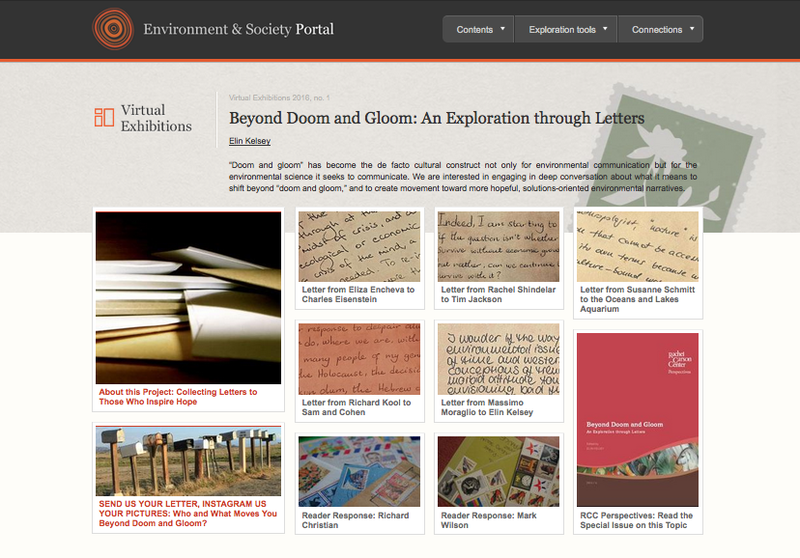 In our latest virtual exhibition “Beyond Doom and Gloom: An Exploration through Letters”, curated by former Carson Fellow Elin Kelsey, the Environment & Society Portal charts a path on how to share a vision in the digital age. The idea for the exhibition emerged from a workshop hosted by the Rachel Carson Center in 2014. The exhibition consists of seven letters, addressing the cultural concept of “doom and gloom” with regard to the issues we are currently facing at the beginning of the twenty-first century. The exhibition’s goal is it to create a more hopeful narrative that focuses on solutions rather than the negative. While an ordinary, single, handwritten, and posted letter is probably only read by the composer and the recipient, an electronically published letter—by contrast—can be shared and potentially be seen by an unlimited number of readers. What gives YOU hope? We invite readers to respond to the virtual exhibition, to share their own visions of a world beyond doom and gloom: through a comment at the bottom of any letter featured in the exhibition, an email, a photo of a letter, or a photo of a reader-turned-composer and his letter, a comment on Facebook, a tweet (#beyonddoomandgloom) or a picture of something that gives the reader hope via instagram (#beyonddoomandgloom). Alternatively, readers can also respond offline with an old-fashioned letter or a postcard. We also encourage instructors to turn this opportunity into a class project: let your student write letters of hope. Send your letter—electronically or on paper. You can also do so anonymously. Selected responses may be published as part of the exhibition. Visit our virtual exhibition here and help us overcome doom and gloom by sharing your vision of hope. We look forward to hearing from you!